The front page of today’s Halifax–Plympton Reporter features our newly created partnership with New England Village. As the warm weather of spring approaches work on Plympton’s Colchester Neighborhood Farm intensifies. But this year it is a little different. 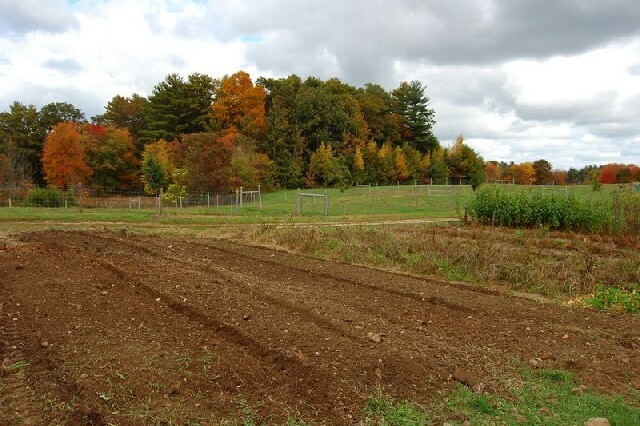 Jan. 1, New England Village, a human-service agency based in Pembroke that supports adults with intellectual and developmental disabilities, signed a lease agreement with the owner to take over the 8-acre Baystate Organic Certified Farm. In addition, New England Village retained Kingston resident and farm manager Connie Maribett, who has been operating the farm with her husband, Ron, since 2000. Click HERE to read the entire article and view photos! Colchester Neighborhood Farm has recently established a Facebook page which includes frequent updates, photos, a discussion board, event links, and more… check it out! This weekend at our Harvest Festival, Ron tilled up the future home of our flower bed and it was seeded a green edible manure (“Aren’t those two things mutually exclusive! ?” someone yelled out as Connie was describing the seed) to prepare it for planting next year. It’s in a beautiful location right at the front of the farm and we can’t wait for it to be bursting with color. If you’d like to contribute to our flower bed, we’ll be happy to take any perrennial flowering plants you can donate. This is a full-sun area, so keep that in mind. I know it’s only October, but I’m counting down the days to spring and fresh-grown flowers already!